viaLibri ~ Survey of Northern Territory. 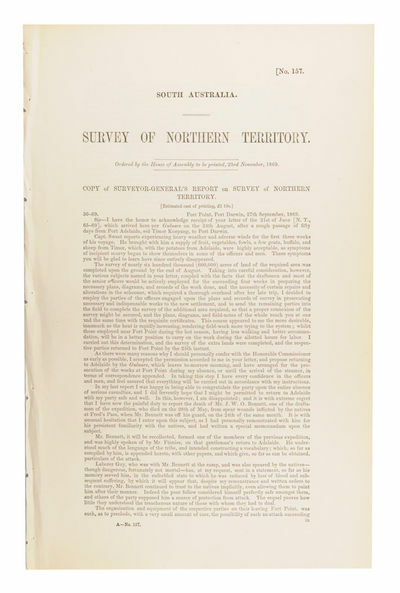 Copy of Surveyor-General's Report ..
Survey of Northern Territory. Copy of Surveyor-General's Report ..
[Adelaide, Government Printer], 1869. Foolscap folio, 5 pages. Drop-title; pinholes in the inner margins where sewn when bound (now neatly disbound); a fine copy. South Australian Parliamentary Paper Number 157 of 1869-70. A detailed report by George Goyder from Fort Point, Port Darwin, dated 27 September 1869: the first two pages discuss the death of Bennett (from spear wounds) and race relations generally; then follow outlines of the recently completed land survey, a description of the country and its minerals, and the natural history specimens despatched to Adelaide. Important and rare. Offered together with a copy of the Proceedings of the Royal Geographical Society of Australasia, South Australian Branch, Volume 79, 1978, containing a relevant article by Michael Williams: 'George Woodroofe Goyder - a Practical Geographer' (22 pages with 3 maps and 3 plates).